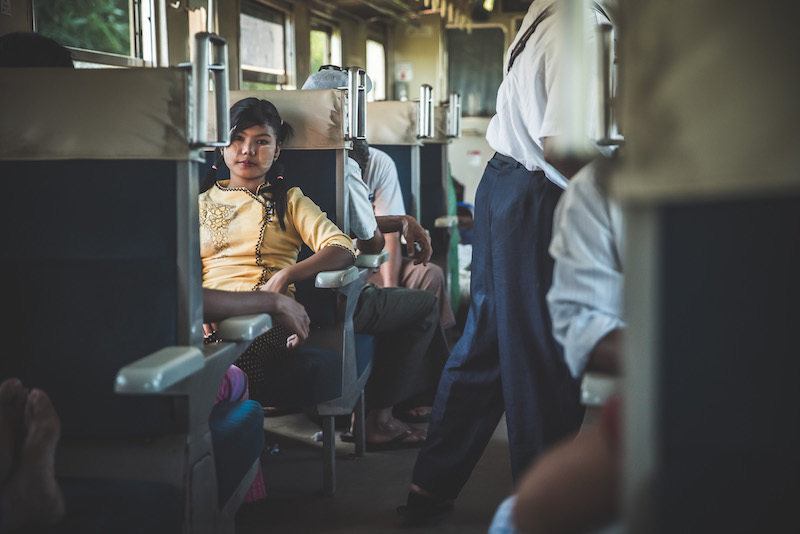 Riding the rickety Circle Line train is a travellers must-do in Yangon. 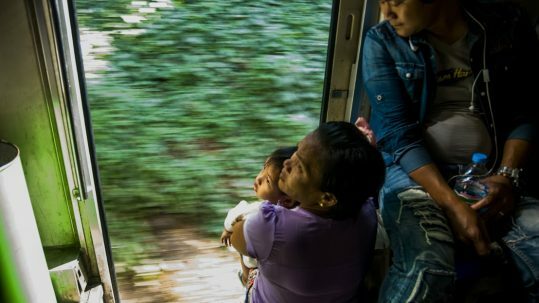 For less than one US dollar you get an intimate glimpse in the local life of the city. 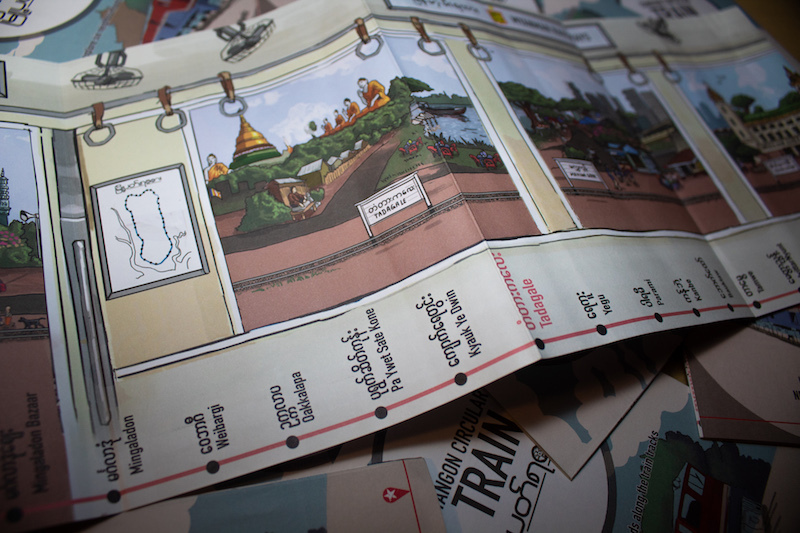 The full loop, takes three hours and is like a ride through history, introducing you to Yangon’s more authentic side. 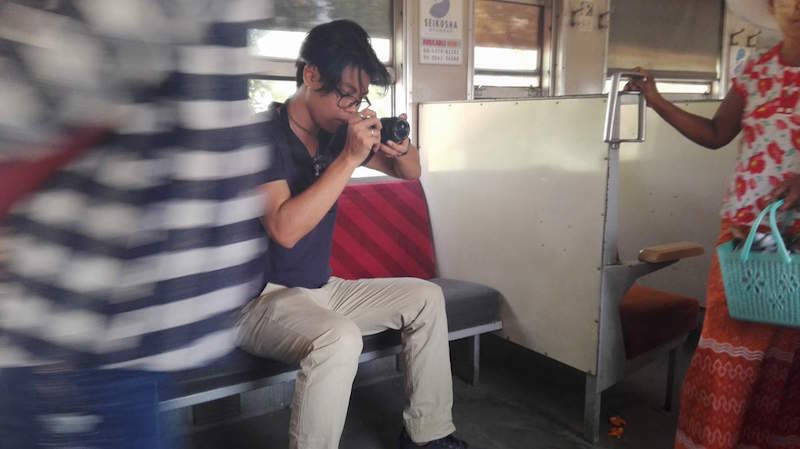 The train journey itself is a great experience, just observing life as it passes by; but where to get off? 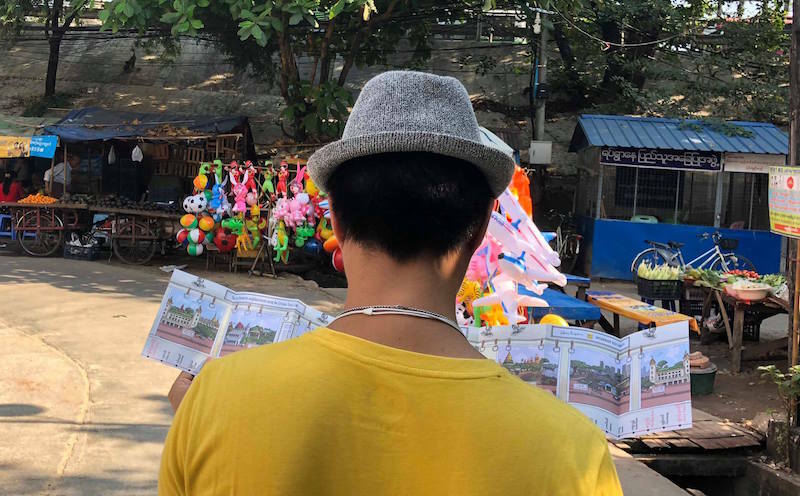 The team at iDiscover made a Yangon Circular Train Guide – a handy map with a savvy app – highlighting six neighbourhoods that are worth a wander. We hopped on the train with Jackie Lynn, a local artist who designed the map, and looked at the city through his lens. 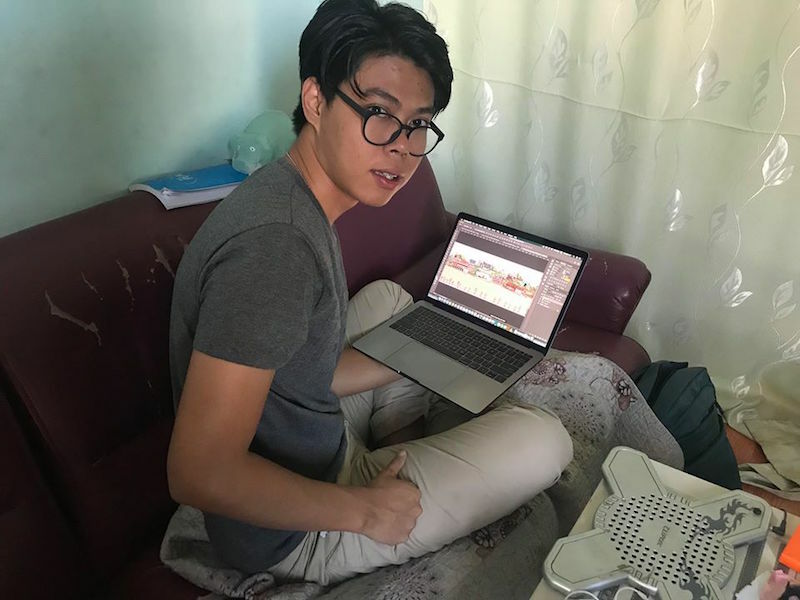 Jackie is a Yangon based graphic illustrator. 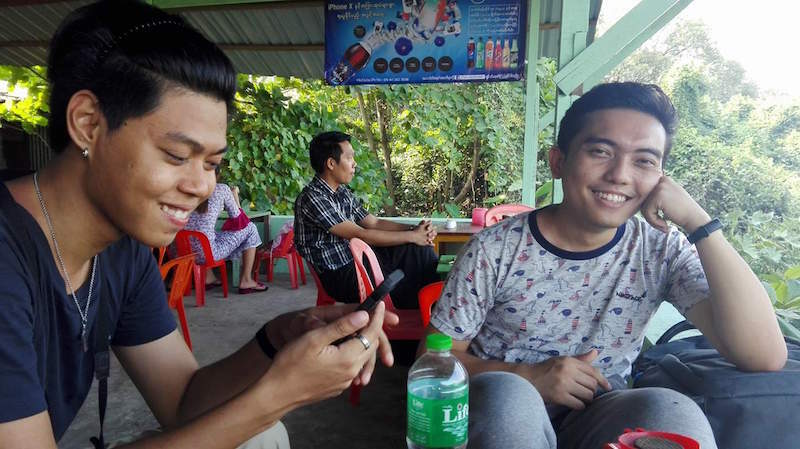 Originally from Magway, he moved to Yangon six years ago. His cartoony style landed him jobs with some of the coolest design firms in town and he continued to develop his design signature, one that is full of beautiful light and character. When we asked if he’d like to capture the unique energy of the Circular Railway in a series of illustrations, he didn’t hesitate. The result is a map that’s almost a journey in itself, a journey along six stations, six neighbourhoods each with their own character. 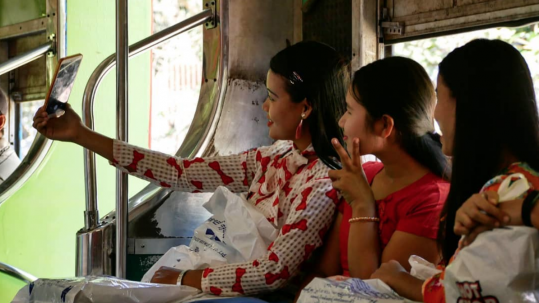 Yangon’s Circular Train Line is 42 km long with 39 stops. Creating a map for the line as a whole and at the same time portray the details of each of the six neighbourhoods was gonna be a challenge. Earlier versions of the map made the design team realise this map couldn’t show the whole of Yangon, the map would simply become too big for travellers to put in their pocket. 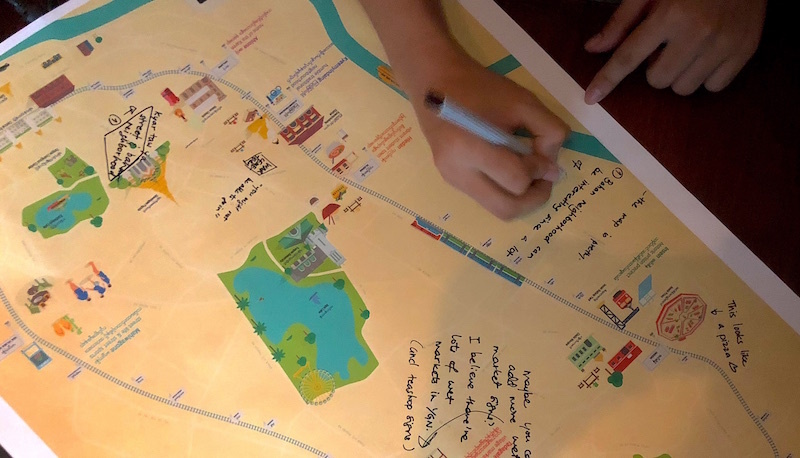 After a brainstorming session with some of the students who helped with the curation process and the fabulously creative people from iDisover’s local partner Hla Day, the team made a design decision to create map that wouldn’t look like a map but more like a journey. “I took inspiration from little things, like the train tickets, the timetables, the signs at the station and even the fans in the train carriages. All these things make the train journey what it is, an iconic journey through time”. 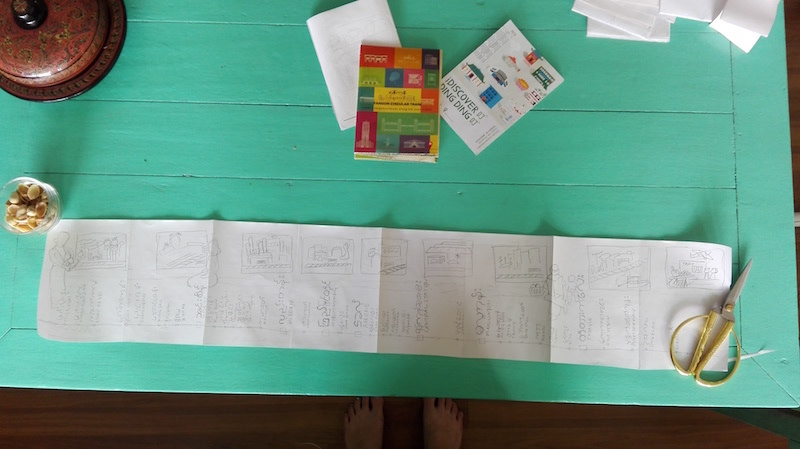 Jackie then developed a rough sketch of the neighbourhoods and the cover of the map. The process was not hiccup free. 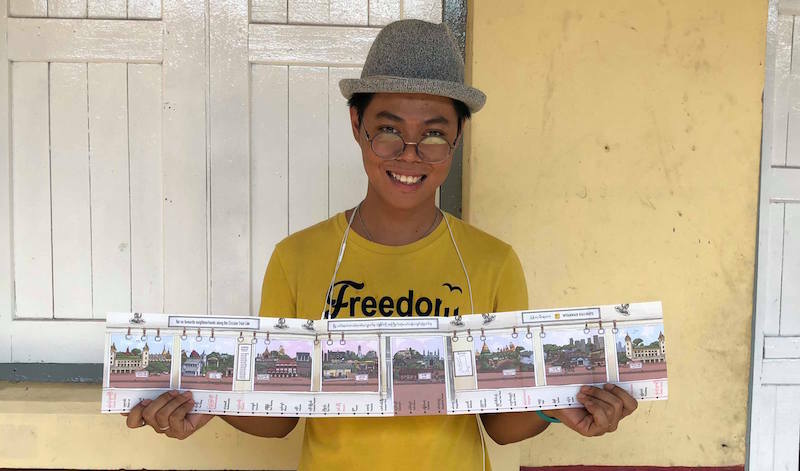 Some of the early designs began to look a little too modern for the Yangon Circular Line Train, and there was so much information we wanted to include but couldn’t fit. It took many back-and-forths to get it right. Jackie says “The hardest part was putting my illustration into the train windows frame without making it look ugly”. Nice to know -Did you know Myanmar actually has an incredibly long history of design and illustration? The country is famous for cartoons. Every year there is a street festival dedicated to comics. This tradition is now evolving artists like Jackie are taking this design heritage and developing it for the current Myanmar. 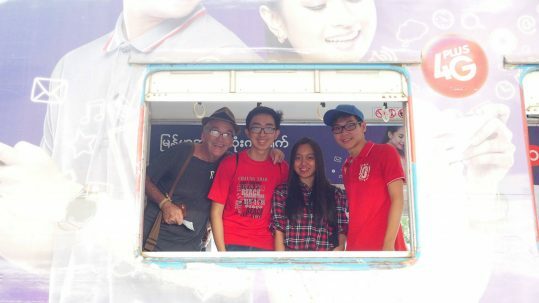 Read more about the history of comic and graphic design in Yangon here. 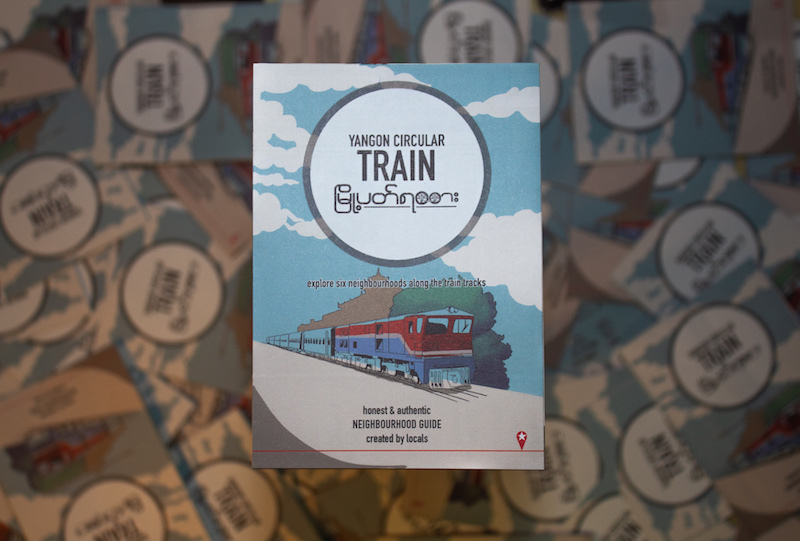 Where to find the Yangon Circular Railway Guide? Love a paper map? We do too! 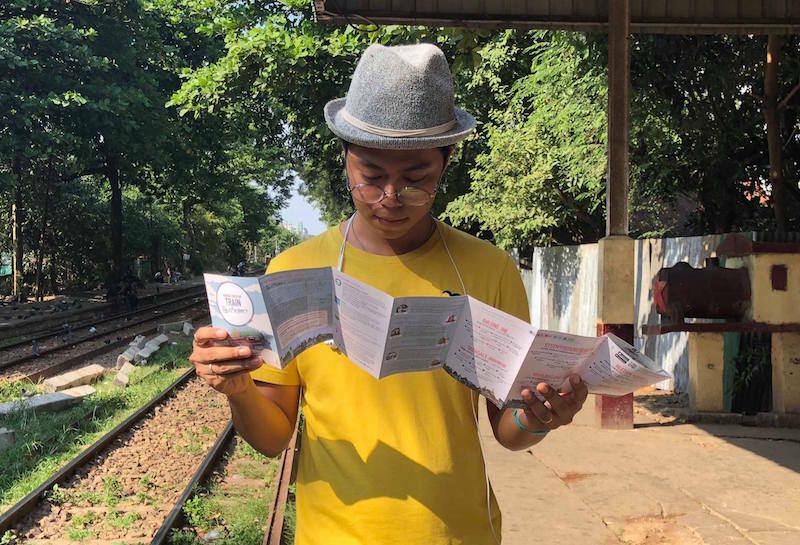 The Circular Railway Guide is one of the six handcrafted itineraries in the iDiscover Yangon Neighbourhood Guide, buy a copy for just 15,000 kyat at Hla Day or order a copy online. Like your travel tips on-the-move at your fingertips? We’ve got you covered. This is where you download the iDiscover Yangon App with GPS maps and in-depth stories on each site. Buy tickets from Platform 7 of Yangon Central Station. The fare is 100 or 200 kyat depending on distance. Trains ride in both directions. ‘R’ indicates eastbound at Yangon central Station (anticlockwise) and ‘L’ is westbound (clockwise). The train starts running at 6.10 am with the last departure at 10pm, but the earliest full circle train leaves at 8.20am heading west (clockwise) and the last one departs 5.10pm. The railway opened for service in 1954 and still has an operational fleet of 200 coaches on double track. The service runs 20 times a day. The tracks are old, carriages are a bit dated and non-air-conditioned, so be prepared for a hot, bumpy ride and a great experience! 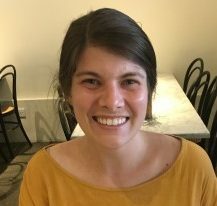 Anna Livia Cullinan is originally from Ireland, grew up in the US, studied in the UK and now calls Myanmar home. Many years in film industry have creatively shaped her mind until she was ready to venture out in the big world. Anna Livia has found her muse in vibrant and mystical Yangon.